The Awards Application are now open. There are many inspiring women including ,perhaps even you!. Nominees are people who deserve acknowledgment and recognition for achievement while residing in Europe. Examples could include personal contribution in the community one lives in , or even what they have contributed in Africa. The judging panel will consist of carefully selected prominent members of the African Women living in Europe who have a proven track record and expertise in their various fields. They will offer their insight, dedication, experience and impartiality when deciding on those who make it to the final shortlist for the public vote. There has been many articles and bad news on women and girls injustices all over the world. AWE theme for 2015 is Leadership and Honouring Women’s Rights! 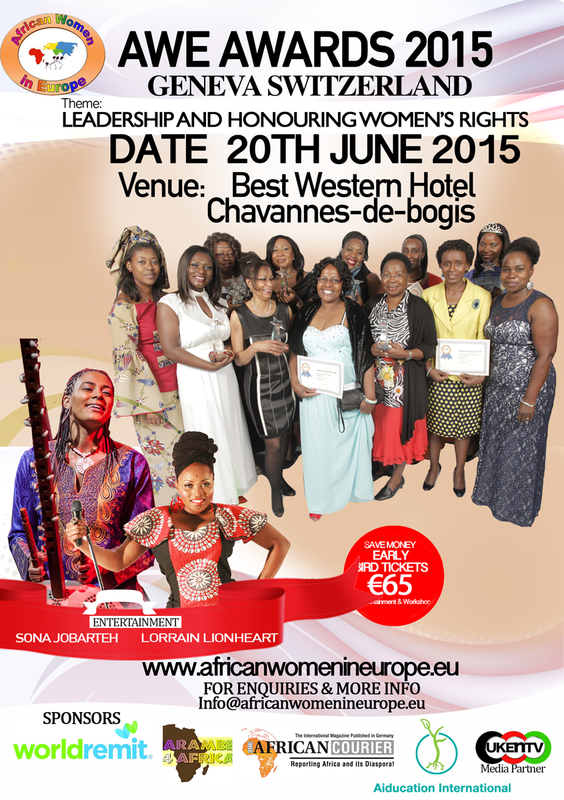 Reserve the dates on your calendar, make it a weekend to travel to Switzerland and meeting other African Women living in Europe, friendship and partnership can be formed and a greatway to network! !